I know I am not alone when I say that those first memories of meeting your partner’s family can be kind of indelible. There you are, ready to please, hoping to make a good impression, smiling to beat the band. Mentally humming a few bars of that old classic “I’m Going to Make You Love Me,” by Diana Ross. I surely remember meeting my husband Gary’s family for the first time. For some terrible, undecipherable-in-the-rearview-mirror reason, it was decided that upon our arrival in his hometown in central Massachusetts, we would meet up with his younger brother to go see the Holocaust movie “Schindler’s List,” and then we would all return to the family home where I would meet and spend the weekend with his whole family for Passover. I had brought the ingredients for a flourless chocolate cake to prepare there—flourless as during the period of Passover, no leavened grains are permitted (see: Israelites fleeing across the desert). While I am in fact Jewish, the sum of all of these parts was more Jewishness than I had experienced in perhaps the 10 previous years combined. Let’s just slide right over the fact that no one is able to make a pert and sunny first impression after sobbing through three hours of “Schindler’s List.” And that the chocolate cake was a stunning flop, and I had to pretend I was going for some sort of craggy pudding, which was extra humiliating because, while not yet a food writer, I was a cookbook editor. Let’s just say I hadn’t exceeded expectations. The next evening, we went to Gary’s Great Aunt Lois’ house (his mother’s mother’s sister) for the second night of Passover. Great Aunt Lois was a woman who clearly had earned—and enjoyed—the title of matriarch. She could also be described with words like “unfiltered” and “opinionated” and “tough cookie.” She ran her large Passover Seder like an army general, cards tables and folding tables lined up, briskets sliced and warming in the oven, plastic soup bowls stacked up and ready for action. The dinner took place in her finished basement, where apparently large bowls of whole walnuts, accompanied by nutcrackers, were on offer all year round, and were definitely being enjoyed that night. I’m allergic to nuts. Gary explained the situation, and the bowls were removed. Still, after about five minutes in the windowless basement, I was not feeling or looking too great. Eyes still swollen from “Schindler’s List” were getting puffier. I was clearly in danger of being permanently labeled “that feeble girl from New York City.” I took a Benadryl and found various reasons to move about the house. The chicken soup was served. It was delicious. We all marveled at the matzoh balls: so light, so delicious, not at all heavy (overheard: “like some other people’s, who we won’t mention”), so well-seasoned. A matzoh ball triumph. On one of my breaks from The Walnut Dungeon, I decided to buck up and head right into the kitchen and offer to help. I told Aunt Lois that her matzoh balls were tremendous, the best I’d ever had. I wondered if she might be willing to share the recipe with me, just a watery-eyed little newcomer, who really appreciated excellent home cooking and recipes. Many years later, I still use Aunt Lois’ recipe: that good old box. It’s really not a bad shortcut; all that’s in it is matzoh meal, salt, and some seasonings. That then begs the question: Why not just mix it up myself? It’s not that big of a time saver. Well, I use the box because sometimes that little bit of saved time and convenience is what puts me over the edge when I’m deciding if I should make chicken matzoh ball soup or not. And of course I should. It is, in fact, my family’s favorite soup of all time. Now, sometimes I’m in a make-my-own-broth-entirely-from-scratch phase, but more often than not I’m in a we-want-soup-now phase. This method is a compromise between using all canned or boxed broth and making my own. Here’s the scoop: When you cook chicken in water to create broth, pretty much all of the flavor of the chicken goes into the water to create the broth, leaving the chicken itself pretty tasteless. You then have to go and roast a whole other batch of chicken to shred and add to the soup. That’s a lot of chicken, and a lot of time. Instead, I essentially poach the chicken in pre-made chicken broth, which simultaneously enriches the soup and the chicken itself. The chicken gets the flavor from the broth, and the broth gets more flavor from the chicken. A win-win kind of a thing. 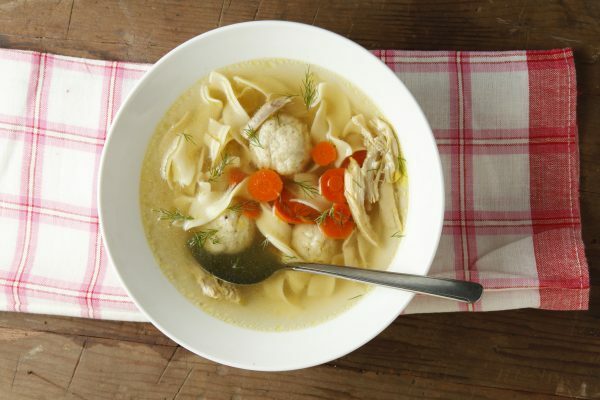 Passover is around the corner, and for that holiday, this soup will have just the chicken, vegetables, and matzoh balls. During the rest of the year, I also include egg noodles, sometimes wide, sometimes thin. 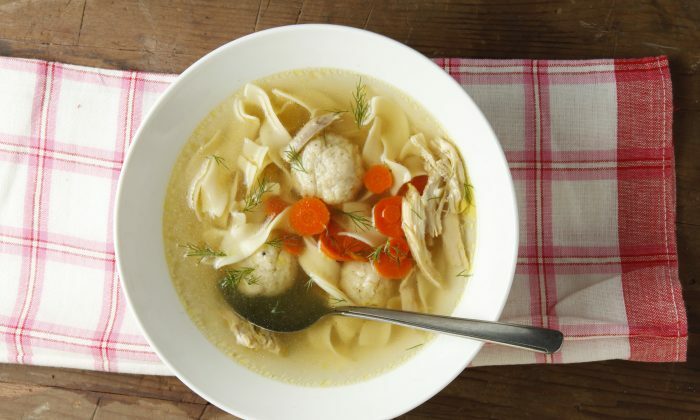 But Passover or not, with noodles or without, I am always ready to make this soup—and I always have a couple of boxes of matzoh ball mix in my cabinet. Because Aunt Lois said it was okay. Place the chicken in a large soup pot or Dutch oven, add the onion and the chopped carrots. Add the chicken broth and enough water to fully cover the chicken. Place over high heat, bring to a full simmer, then lower the heat to medium-low, and simmer, partially covered, until the chicken is fully cooked, about 1 hour. If the level of liquid seems like it’s reducing too quickly, you can add an extra cup or two of water. Meanwhile, make the matzoh balls according to package directions. Carefully strain the soup into another soup pot, and set aside the chicken to cool slightly. When cool enough to handle, shred the meat into nice bite-size pieces, discarding skin, bones, and any gristle. Bring the soup to a simmer over medium heat and add the sliced carrots and the dill. Simmer until the carrots are tender, about 8 to 10 minutes. Taste and adjust the salt and pepper as needed. Return the chicken to the pot (adding as much as you like, reserving the rest), along with the cooked noodles and the matzoh balls. Allow everything to heat through, ladle into bowls, and serve.